I mentioned Swagath briefly in the intro to my review of Kerala Express. It opened in Defence Colony about ten years ago and was a sensation with its southwestern/coastal menu, with an emphasis on Konkani food. This kind of thing is all over Bombay, of course, and is far superior there but it was, by and large, new to Delhi. I can’t remember when Dakshin at the Sheraton opened but that was, of course, both far more expensive and also served a broader South Indian menu than Swagath did/does. 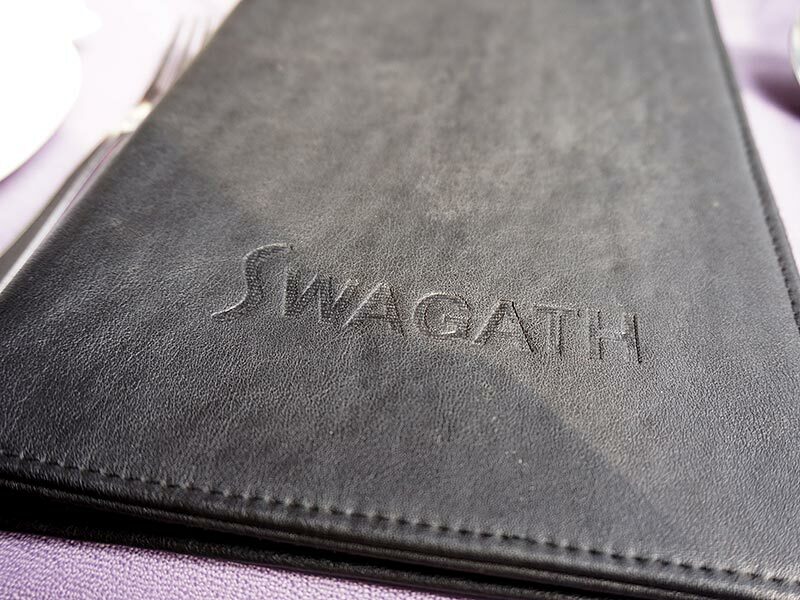 This is not to say that Swagath’s menu only or predominantly features food from the Konkan coast and environs. As is often the case in Delhi, it has been a “multicuisine” restaurant from the start, and you’ve always had to leaf past the Mughlai and Chinese sections of the menu to get to the interesting stuff. And that, in short, is a good illustration of what I said a while ago about the state of regional dining options in Delhi (and elsewhere): once they did not exist; now they do but the gods of butter chicken and chicken chowmein must still be appeased. At any rate, in 2005 many of our friends insisted on taking us there to eat and it was all very exciting. I went back regularly on subsequent trips and it seemed to get a little less exciting each time. Familiarity breeding contempt? The fact that I’d been to Bombay a couple of times since and eaten this food closer to its source (at your Mahesh Lunch Homes, your Ankurs and your Ananthashrams)? Or could it be that as Swagath (and so many other places) franchised or otherwise opened up a large number of branches all over the city and environs its focus and talent pool got diluted? I’ve had more than one indifferent meal at some of the new outposts on recent trips and so this time we decided to return to the mothership in Defence Colony. We began with a glass of tart, spicy and refreshing soal kadi. Soal kadi is made with coconut milk, grated coconut etc. and gets its distinctive flavour and colour from dried kokum petals. Quite nice. This was the dish that first sold us on Swagath a decade ago. Very fiddly to eat if you get it with whole crab as we did on this occasion but very good. There is also a less fiddly shelled crab option and looking back, I think in the past I may actually have preferred the version with squid. To mop this up we got some neer dosas (soft, white and nothing like the crisp dosas most people in the West, or North India, for that matter, are familiar with); but I unaccountably did not photograph them. We also got appams to mop up other things. Rawas is a type of Indian salmon, though not very much like Atlantic or Pacific salmon, and one of the staple fish of the Malabar coast. It is prepared here in the house style in thick, red and spicy masala paste, made with ground chillies, vinegar etc.. Quite nice. Surmai (also known as Seer) is another staple fish of the region–Kingfish, I believe, and gassi/ghashi is a classic style of preparation (not specific to this fish) with grated coconut. Also quite good. And finally, from the small Andhra/Chettinad section of the menu I was not able to resist the Chettinad Pepper Chicken, once again because it is rarely available in the US and where it is, usually in self-parodic form. This was very nice indeed. So, on the whole, quite a nice lunch. Not a necessary stop for anyone visiting from Bombay and parts further south, or for anyone whose itinerary takes them there as well but if you’re North India-bound by all means stop in. And one other, irrelevant note: I’ve always been a knee-jerk complainer about the “multi-cuisine” phenomenon in so many Delhi restaurants that serve regional food; even though I get that it’s necessary from a business standpoint –even at Swagath the majority of people eating there every time I’ve been there over the years seem to have been mostly or entirely eating only the North Indian classics. But on this trip I did appreciate it. Why? Because when you’re traveling with small children who can’t eat very spicy food it’s nice to be able to order fried rice and regular rotis for them. This entry was posted in *Food, Delhi. Bookmark the permalink.